This loop takes you to a beautiful alpine lake that sits below the jagged ridgeline of Ragged Peak. The trail climbs fairly steeply through the forest, then settles into a moderate grade passing the trail that heads to Lembert Dome. This grade continues past the Dog Lake Trail then up and over a small ridge to a wonderful meadow. A fording of Delaney Creek is required to pass through this stunning meadow with views of summits to the east. The trail climbs through more trees eventually giving way to a stunning meadow at the base of Ragged Peak. As you traverse this meadow, the views of the mountains to the south are breathtaking and include some of Yosemite’s highest peaks. After hopping over Dingley Creek, the trail climbs up and over a shoulder of Ragged Peak, then steeply descends to the trail you’ll walk out on. Take a right to head up towards the lake where you traverse the mountain’s western aspect through a wonderful pine and fir forest. A beautiful meadow opens up giving you a great view of the jagged summit of Ragged Peak with its massive boulders sticking straight up in the air. 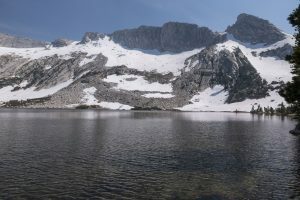 The trail levels out as you cruise to the shoreline of this gorgeous lake backdropped by a massive, gray granite ridge. Turn around and head south, passing the junction with the trail you came in on. The trail descends through a nice, airy forest. 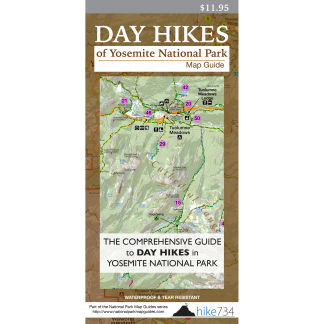 Views to the south are limited until you begin to turn southeast and the trail levels out, eventually joining up with the Pacific Crest Trail and heading past Soda Springs along Tuolumne Meadows to complete the loop. The side trip to Lembert Dome (see Lembert Dome) adds 2.2mi/3.5km and 400ft/120m to your day. The side trip to Dog Lake (see Dog Lake) adds a level 1.3mi/2.1km to your day. Trailhead: Park at the signed Lembert Dome Picnic Area located at the east end of Tuolumne Meadows. The trail begins at the trailhead sign for Dog Lake and Lembert Dome near the restrooms.